View artwork, tutorials and general musings from artist Clare Willcocks. 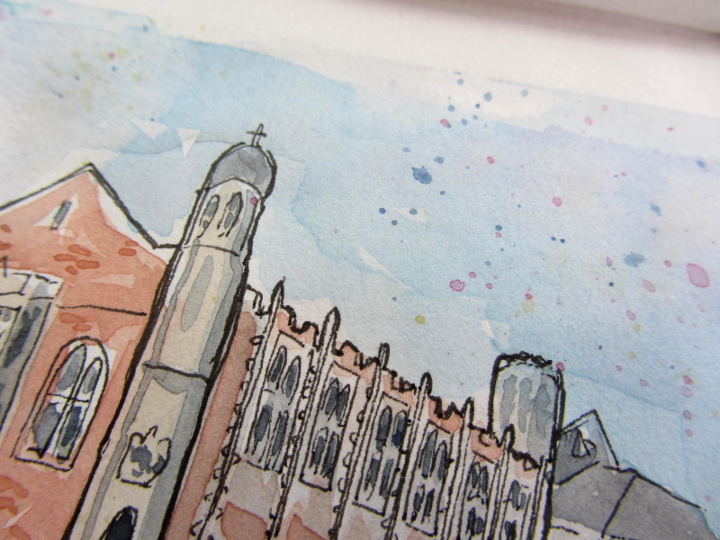 Pen and ink work, watercolours, pencil drawings, paper cutting and everything in between! I have been really enjoying keeping a sketchbook recently, filling it with whatever I feel like drawing or painting without worrying about whether it will turn out perfectly. When I have used a sketchbook in the past, I’ve always been concerned that each page should be beautiful. The trouble with this is that it stops me from experimenting for fear of it ‘ruining’ my sketchbook. This time things are different – I’ve let myself try new ideas and while some of them haven’t turned out as well as I’d liked, I’ve learnt something from each piece. I only have one rule – whatever I start, I must finish. These are my latest experiments. As always, I’m trying to work more loosely, and be less reliant on preliminary sketching. 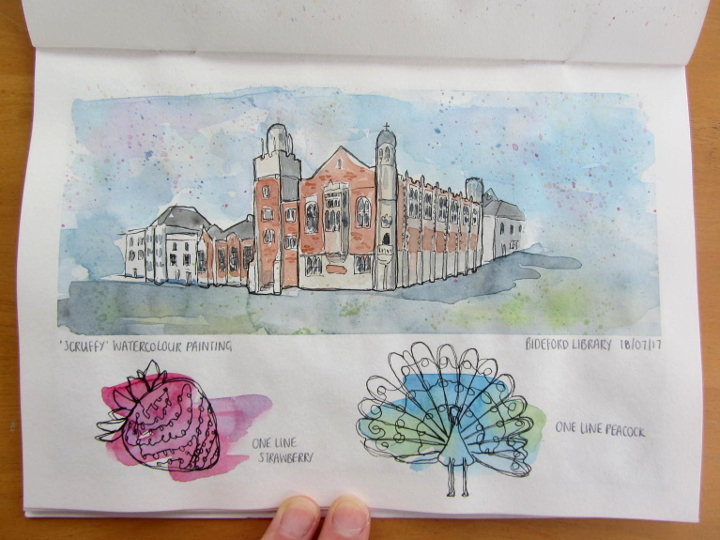 I drew this painting of Bideford Library freehand, starting with the turret on the corner. While I was painting, I didn’t like the way it was turning out, but I really loved it when I’d finished. Now I’m worried I won’t be able to replicate the style again! I flicked paint at the background to create a spattered look which I’ve seen other artists do. It helps to create a bit of interest without needing to add details. I had some room left on the same page so I painted some coloured patches with watercolour and then drew over the top. I got the idea from this video by Teoh Yi Chie. I’m not too keen on the results, but it was only a 5 minute experiment. 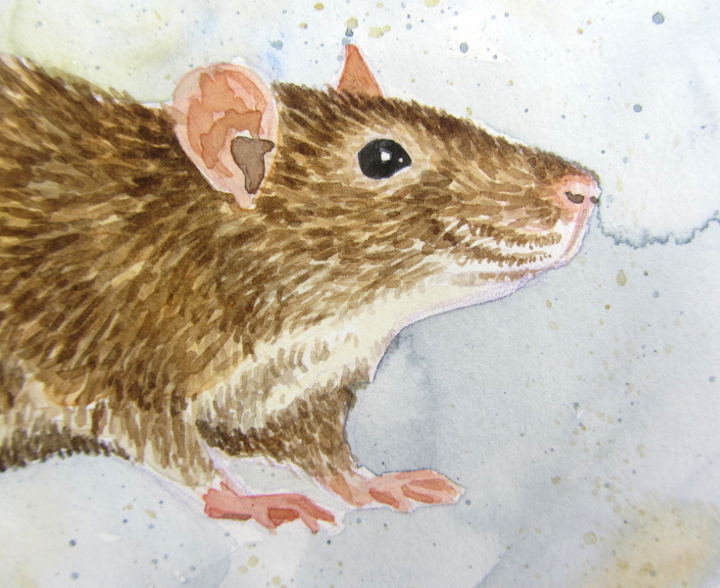 Seeing as I liked the background of my Bideford Library painting, I decided to use a similar technique for this next painting of a rat. 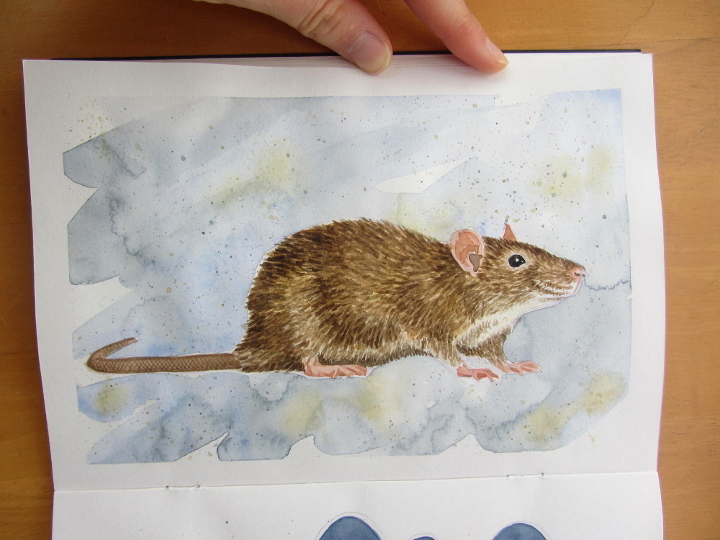 However, I don’t think the background suits the style of painting I used for the rat, which unlike the library painting has no black lines to make it stand out. I do like the rat himself though! Perhaps he’d look better on a white background? Thanks for reading to the end, I’ll back again soon with some more arty updates! Also, thank you to everyone who leaves a comment, I love reading them all! I’m sharing this post on the following blogs: Handmade Harbour, Paint Party Friday and Blue Chair Diary Illustrations! What beautiful experiments! I really love your rat. For someone who can’t stand real life mice and rats, I find they always look so cute in art, and have an embroidered one in my living room! What a lovely sketch book you have! Mine looks very basic, not detailed at all, but as you say, it is for experimenting – not all images have to turn into paintings. More lovely work, you are so talented. 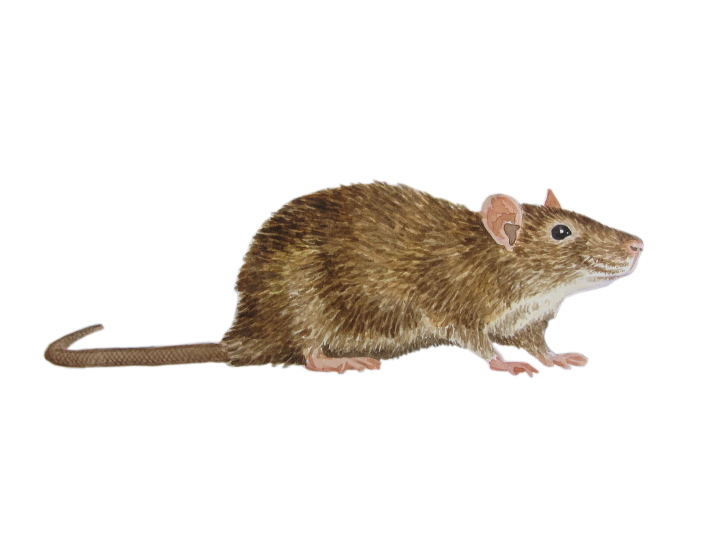 Your little rat does look better on the white background but honestly, he doesn’t look terrible on the mottled one! I think you are super critical of your own work. I love your strict, i must finish what I started’ mentality. I think I could take a leaf out of your book on that!